HomeShop18 is one of India’s oldest electronic retail merchants. With a promise of providing quality, value and convenience, HomeShop18 is your trusted go-to supermarket where you can get everything for your home and family; be it clothes, shoes, accessories, mobiles, gadgets, electronics, home furnishing, domestic cleaning utilities, beauty products et al. And you can get some amazing HomeShop18 deals and discounts on Zingoy, here. 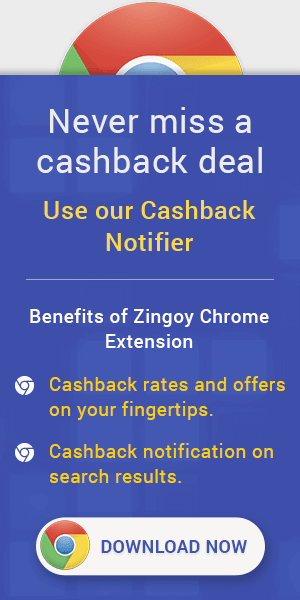 Also, you can earn loads of cashback with Zingoy on all your and your friends’ online shopping from Homeshop18. Products Like (Refurbished) Blackberry Key one Single SIM 4G LTE Android Mobile Phone, (Open Box) OPPO F9 Pro Dual SIM 4G VoLTE Android Mobile Phone (6 GB RAM), (Open Box) LG G6 Dual SIM 4G LTE Android Mobile Phone (4 GB RAM), (Open Box) Samsung Galaxy A6 Plus With Infinity Dual SIM 4G VoLTE Android Mobile Phone (4 GB RAM), DOMO Slate S9 Dual SIM 4G VoLTE Android Calling Tablet, I Kall N1 4G Dual SIM Tablet with Calling, Lava 13.84 cm (5.45 inch) 4G Phone With Fast Charging + Clip Lens FREE and More..100% Original & Authentic Products. Easy Return & Replacement Available. No Coupon Code Required. Products Like Aapno Rajasthan Resin Indoor Water Fountain - Black, Aapno Rajasthan Metal Tea Light Holder - Silver, Pack of 2 Printed Mattress Protectors By Royal Living, Buy 30 Get 30 Organized Packing Cover by Pretty Kraft, Maha Combo - Cleaning Solutions By Super Clean, Buy 8 Get 8 Handi Set By Classic Essentials, 62 Pc Printed Dinner Set by Homray, 51 Pc Living Room Decor Set By Royal Home and more...100% Original & Pure Quality Products. Brought to you by Urbanchef, this cookware set is a must-have kitchen utility for every smart women. Made from superior quality aluminum body material with Bakelite handle material that is easy to hold while preparing delicious delicacies. Available in stylish colors: Yellow, Red ,Pink and Blue. The combo includes 1 Tawa,1 Grill Pan,1 Kadhai, 1 Tadka Pan,1 Steel Lid, 2 Nylon Tools. Buy online VIP hair colour shampoo at best price only at homeshop18. This is a 5 in 1 product (head, moustache, beard, chest and hand) product. For it application you dont need any gloves brush or bowl as it leaves no stain. The shampoo has a pleasant fragrance and is tear free. Amazing results in just 15 minutes. It provides 100% grey coverage. Has no ammonia. Natural black color, use it like a normal shampoo. Compared to the expensive cost for dyeing hair in the salon, this hair black shampoo is more cheaper. It does not have harmful effects like other hair dyes. Shampoo is fortified with conditioner for brighter, softer and shinier hair. No need to mix a colorant & developer pour it and use as a shampoo. Can be used by both men and women. 100% Original & Authentic Products. Jewellery Care: Protect your jewellery from sharp blows, scratches and extreme temperatures. Avoid contact with perfumes , sprays, chemicals and water. Keep your jewellery in a clean, dry and airtight box. Wipe it using a soft cloth regularly. Gold and silver jewellery might get tarnished if not worn regularly. Place anti-tarnish strips in the jewellery box. Products Like Couture Cat- 4 Satin Stretchable Leggings + 2 Denim Jeggings, Vida Women's Unstitched Salwar Suit - Green & Purple, Pack of 6 Dhoti Pants By Peachy, Pack of 4 Designer Printed Suit Materials By Chhabra 555, Pack of 7 Leggings By Popstash, Ishin Georgette Saree - Multicoloured and more...100% Original & Authentic Products. Available In Various, Size & Colors. Products Like Stitchsensation Women's Rayon Kurta & Palazzo - Red, Stitchsensation Women's Rayon Kurta - Off-White, Fashnet Women's Crepe & Net Kurta - Blue, Style Amaze Women's Poly Cotton Kurta - White, Pack of 2 Reversible Kurtas By Mithi Mirchi, Vida Women's Georgette Kurta - Grey & Pink and more...Pure & Authentic Products.